If you’re looking for one of the easiest and cheapest ways to stay fit or perhaps lose wait this winter why not try a Stationary Bike? When the industrial revolution started it didn’t take long for people to move indoors and get fat! Shortly after that inventors and engineering entrepreneurs starting think of new and innovative ways to help people get fit even though they were no longer doing physical labor in their work. One of the first pieces of exercise equipment to be born was the Stationary Exercise Bike. Stationary bicycles are a simple, safe and easy way to get your daily dose of necessary exercise. Historically these bikes came in upright versions that looked very much like their street bike cousins. Another style of exercise bike is the Recumbent Stationary Bike. This style of bike allows the exercise to sit with their legs outstretched. It can be very good for people who may have problems with balance or even getting on a traditional bike. The latest and greatest type of bike is the Eyliptical, sometimes referred to as an Elliptical Bike or Cross Trainer Bike. It does matter which version you choose any Stationary Bike will provide a great low impact cardiovascular workout. Compared to treadmills and some other exercise gear these bikes are also very quiet in operation and don’t take up a lot of space. Bicycling has been a popular and effective form of exercise so a very long time and it continues to be one of the most popular ways to stay fit today. When winter comes and the weather turns nasty there’s no reason to stop cycling – just move it indoors. One cheap and simple way to do that is to get a stationary bike stand for your outdoor bike. It’s also the method preferred by serious cyclists as they are very attached to their bikes and want to continue to train on the same equipment they will race in the summer season. Of course most people simply prefer to invest in a bike which is specifically made for exercise indoors. 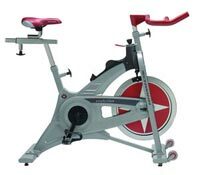 The Schwinn stationary bike is an excellent example and one many people are familiar with. Working out on a stationary bike is an excellent way to burn fat and by raising your heart rate. This is called cardio-vascular exercise and it’s the most effective way to burn fat. But riding does more than exercise your heart and burn fat it also tones your legs, hips, thighs and glutes (bum). Any form of cardio-vascular exercise like biking reduces your risk of heart disease. It’s also very effective in lowering high blood pressure and overcoming osteoporosis. Riding a bike indoors or out improves flexibility which benefits your joints. Using your Stationary Bike can also reduce signs of aging and contributes to your mental health. In fact all forms of cardio exercise are now being prescribed to treat depression. It’s really great that you shared this info. I needed some ideas for keeping fit this winter. Thanks. Oh yah! You are right, exercise is good for your health and a stationary bike is a great solution for the winter months.